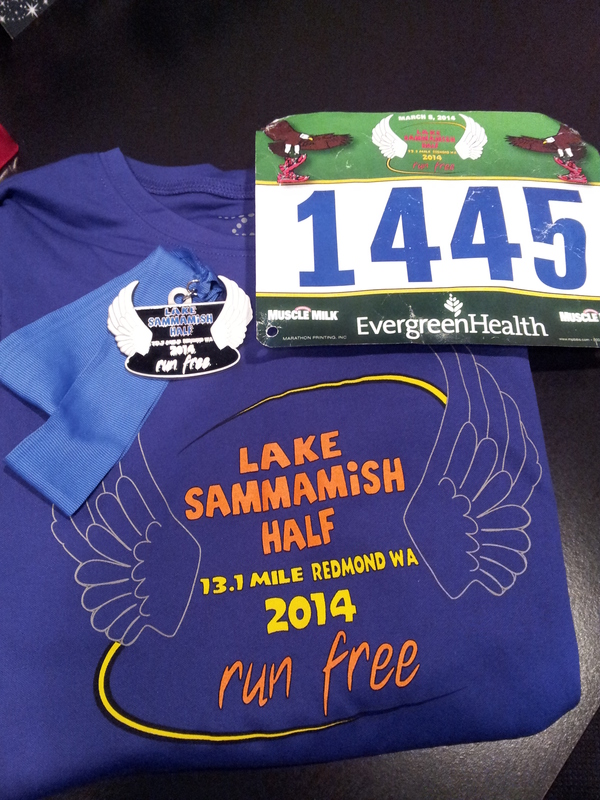 Last Saturday I ran the Lake Sammamish Half Marathon. I registered for this race back in October, with my friend Jamie. Jamie and I before the race. Her picture. The last few emails from the race had warned about traffic and to get there early. For a 7:30 start Jamie and I were there about 6:30. But I guess some people didn’t listen and because of traffic the race started 15 minutes late. Late starts are tough for the runners that have shed their warm clothes and are now waiting and getting cold. Strike One. I was not going for a PR at this race, just a sub 2. This was the flattest half I have ever run. It is a point to point on the trail along the lake. 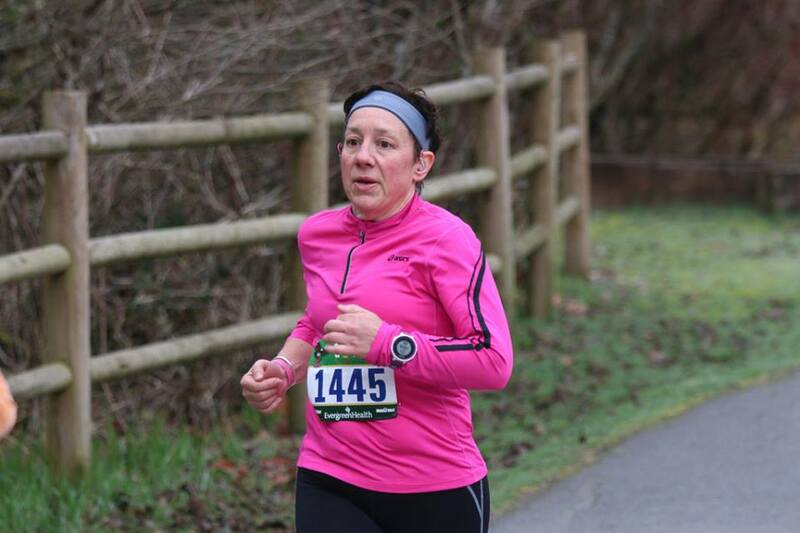 Free race photos! Thanks Woodinville Bicycle. It was pretty uneventful. I kept to about a 9 minute pace and had no issues. I have used peanut M & M’s and jelly beans for fuel since training for NYC and it works well for me. I stopped at each water stop for water/Nuun, I think there were 5. I finished in 1:56:56 BUT my Garmin was 12.88. In talking with many other runners all Garmin’s were between 12.86 and 12.91. The course was short. Strike Two. What is with the DIXIE cups at the end of a race! PLEASE give me a bottle of water. Strike Three. Jamie did have a bottle of water for me, but we did see each other. The post race food and vendors was great. Bananas, apples, coconut water, Kind bars, pretzels, peanut butter sandwiches. After getting a few things to eat and not seeing Jamie I walk to the buses to bring me back to my car. I don’t run with my phone, so I figure I should get to it to call her. It was a 30 minute bus ride. I got to my car quickly changed and met Jamie and her friend, Jane at Family Pancake House. It is a great, basic breakfast spot. This is a very popular race and sold out this year, but I probably will not run this race again. I don’t love the total flat, point to point, late start, short course, no water bottles. Do you have any race pet peeves? 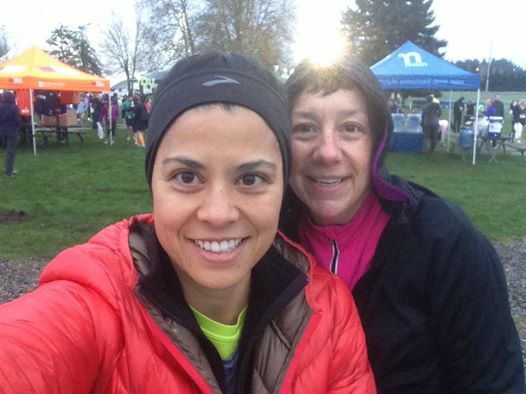 This entry was posted in Uncategorized and tagged Lake Sammamish Half Marathon, Running. Bookmark the permalink. Oh bad strikes Lake Sammamish! Late start and no water bottles at the end would probably prevent me from doing a race again too. But way to still rock it, your commitment to training seriously inspires me every time I see you post about a run! Maybe it will inspire me to actually run more in the near future ;). Ragnar will be here before I know it! Maybe we can get Sixpackrack together for a run/breakfast soon. Crazy they warned people about traffic, they didn’t listen, so everyone who listened had to sit and wait. Shame on them. I ran a race where there was NO WATER that I could find. All I saw was a huge long line for beer, so I went without. Not what you want to do after 13 miles! First time I’ve ever had to deal with that and hopefully the last. I don’t think asking for water at the end of 13 miles is too much to ask. A lot of these race fees are pretty steep. I hope your shins are better. I was irked about the finish line water situation too. I walked past the cups because I thought there’d be bottles somewhere. I tried Muscle Milk (yuck) and coconut water (yuck) and gave up. The good food did help though. Also, I didn’t receive a single pre-race email. I checked and the only email I ever received was my registration confirmation (back in September!). Perhaps this is why traffic was so bad? Because people like me never got a warning about it? I was lucky; I know the area so we came in from the east entrance with no problem. But maybe the issue wasn’t the traffic on race day so mcuh as a huge communication problem. Oh man- I ran this race also. That traffic was absurd, but I totally appreciated how many shuttle buses they had. I probably won’t run it again either–that course was kinda boring. My biggest pet peeve is insufficient honey-bucket-age. Running races usually get it right, but I find that a shocking amount of triathlons severely underestimate things.